A brand that I’ve admired for a while, who focus on bringing out the beauty of natural timbers in their pieces. It was a pleasure to see them in the flesh at my recent visit to In the Neighbourhood. Noorstad was born from a long lasting love for design and an urge to create something new and beautiful. Noorstad aim for a new understanding of home. A room for small moments of calm and bliss. Noorstad is a brand that aims for an aesthetic of simple, unobtrusive beauty. They create with the intention of providing great comfort. Legibility means a convergence of tactile comfort, essence of function and pared down design. They work with natural materials and, whenever possible, use natural finishes or none at all so that each material reveals its unique character. Natural materials often age and patinate very beautifully and they tend to feel as good as they look. A carefully polished piece of wood, warm wool and cool aluminium all appeal to the senses - and when treated right they will last a lifetime. Above left, is the Chukka stool in oak at House of Grey, with Vide Ponche Rond by Studio Henry Wilson and Bespoke Panels by Nest Designs. Also available in blackened beech wood (right). Noorstad choose to work only with Danish wood such as douglas, oak and beech. All of which have different characters and call for different shapes and treatments. They find that douglas is perfect for soft, round shapes that display the very distinct growth rings in the wood beautifully. 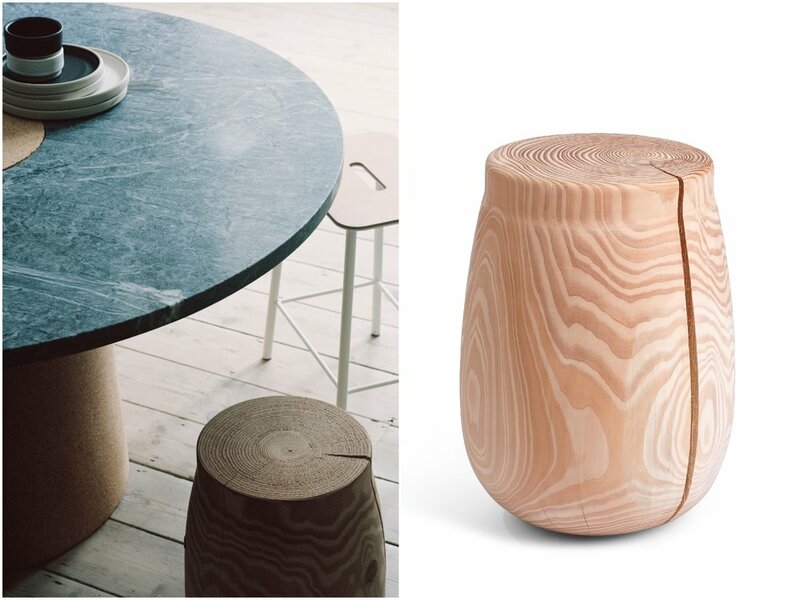 Above left, is the Schola stool in Douglas Fir, sitting alongside Frama’s Sintra Dining Table also at House of Grey. Depending on the shape and the single piece of timber, every item will have a unique appearance and pattern. The wood naturally cracks when taken through the drying process, which is an intended part of the design. They use the solid items primarily as small tables as they like the flexibility and the airy feeling of smaller tables used in combination with each other. This is also why you will not find any coffee tables in the collection. Above, the Laag bench, an ‘extended windowsill’ in Oak (left). Right at House of Grey shows the Laag decorated with a porcelain terrazzo Vase by Natascha Madeiski, an Otto plate by Frama and 2017 by Tycjan Knut. This piece was designed out of the need to decorate in front of large window partitions. Modern homes often display windows from floor to ceiling, and it provides view and airiness, but also lacks something as basic like a windowsill. It is a fusion of a table, a shelf and a windowsill and can be used to display art, plants, books or your beautiful beach finds without disturbing the view.